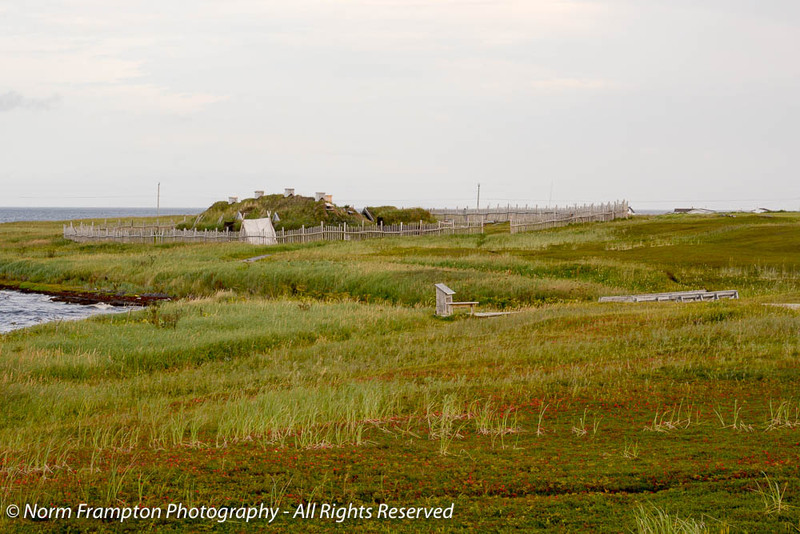 After we finished the hiking portion of our time in Gros Morne National Park we hit the road and drove up to the tip of Newfoundland’s northern peninsula to the L’Anse-aux-Meadows National Historic site. 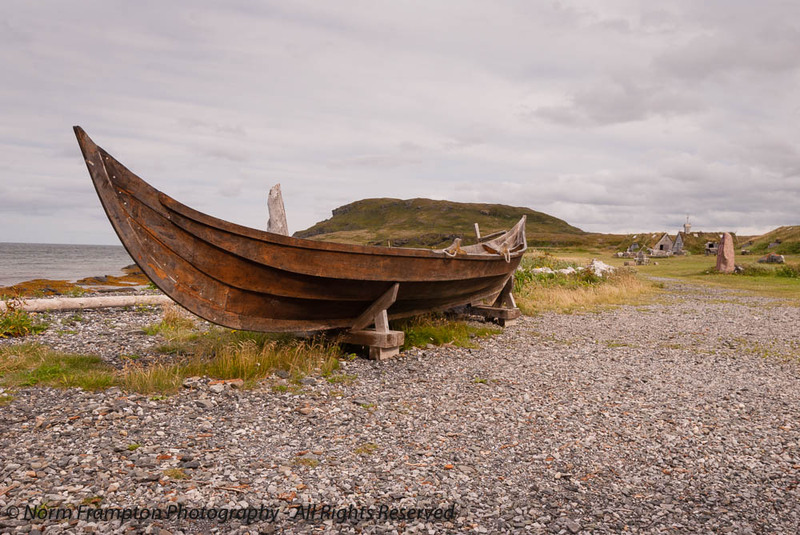 A Unesco World Heritage site since 1978, this internationally renowned archaeological site was discovered in 1960 and contains the only confirmed Norse settlement in North America to date. Sitting at the edge of a meadow on what feels like the ends of the earth, the haunting beauty of this place sets the imagination free. One can’t help but think back to a time when the Norse ruled the waters of the north Atlantic, forever in search of supplies and trading partners, or places to plunder in order to supply their permanent settlements on Greenland and Iceland. 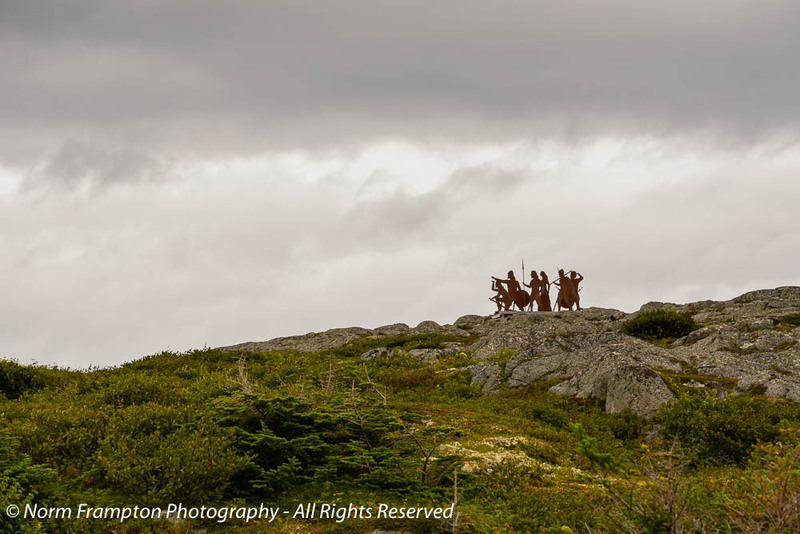 In 1960 after years spent studying the Icelandic Sagas of Norse explorers and their frequent mentions of a place called Vinland, roughly an 80-90 day sail to the west, the Norwegian husband and wife team of Helge and Anne Stine Ingstad came to northwestern Newfoundland, convinced they’d find signs that the Vikings had visited these shores. 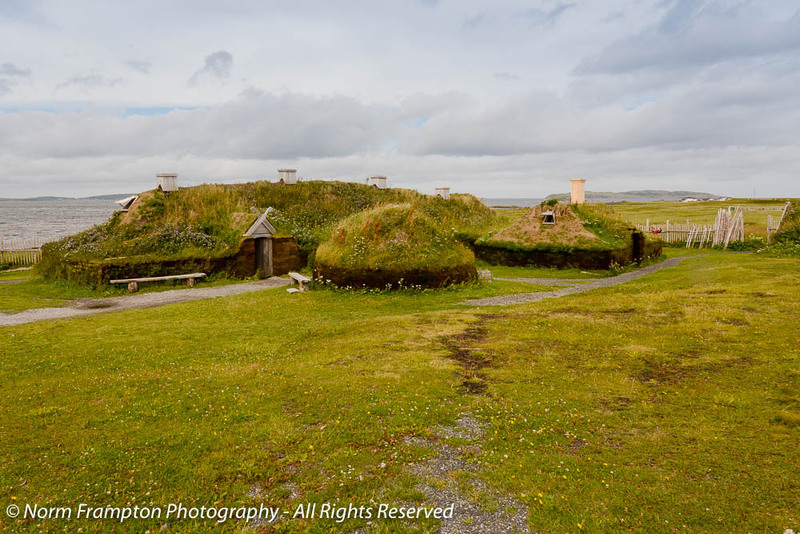 Having seen similar mounds at permanent Norse settlements in Greenland and Iceland, the Ingstads immediately recognized what they represented: Proof that 500 years before Christopher Columbus’ first trans-Atlantic journey, Europeans not only sailed to, but set foot on and for a brief period at least, established livable settlements in the New World. Over the next decade several archaeological excavations were carried out. They found eight complete house sites and the remains of a ninth. The Norse origins of the site were confirmed beyond a doubt because of similarities between structures themselves compared to designs throughout the Viking world, as well as the many artifacts found at the site that were identical to those found at similar sites in Greenland and Iceland from the same time period. 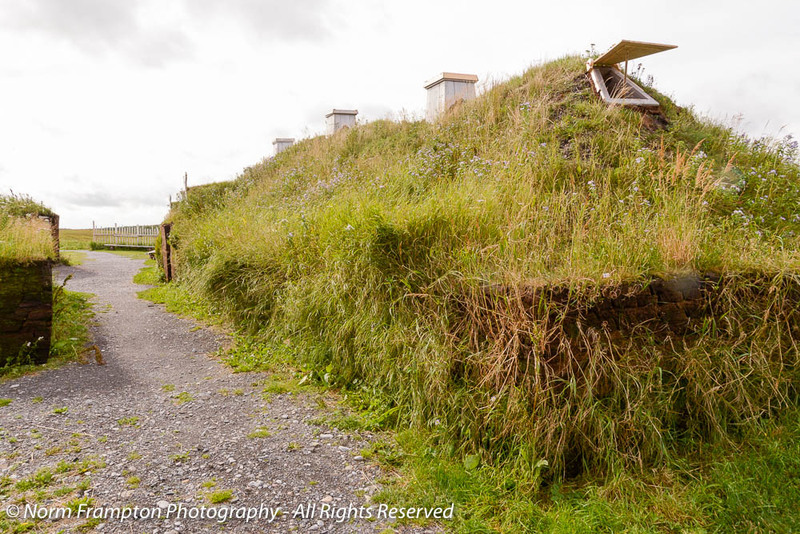 Though the original mounds have been left untouched since the 1980’s, Parks Canada has done a great job of recreating the settlement as it would have looked back then, using original materials and techniques. Walking around the site left us with an eerie sense of isolation that is impossible to put into words. One can just feel the hardships that were endured on the journeys to get here, gather supplies, hunker down for the winter, and then travel home the next sailing season. 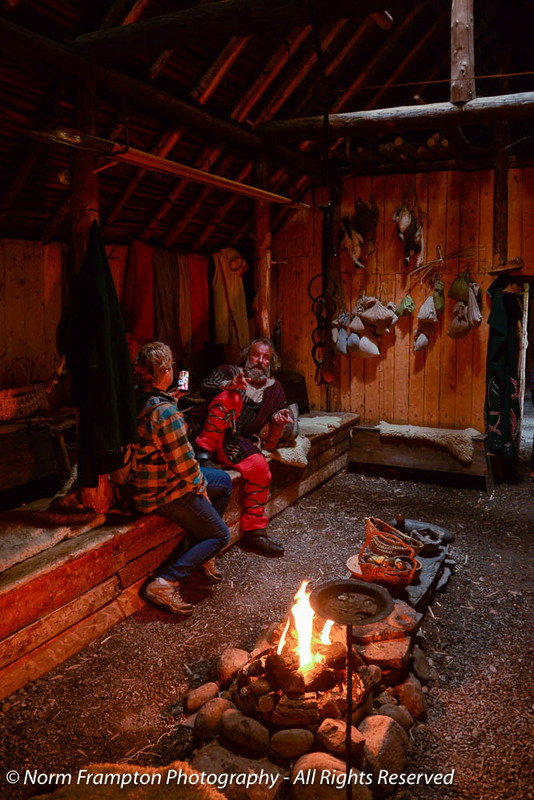 Parks Canada has costumed interpretive guides on-site to share the tales of the Viking sagas and answer questions about what life was like back then. 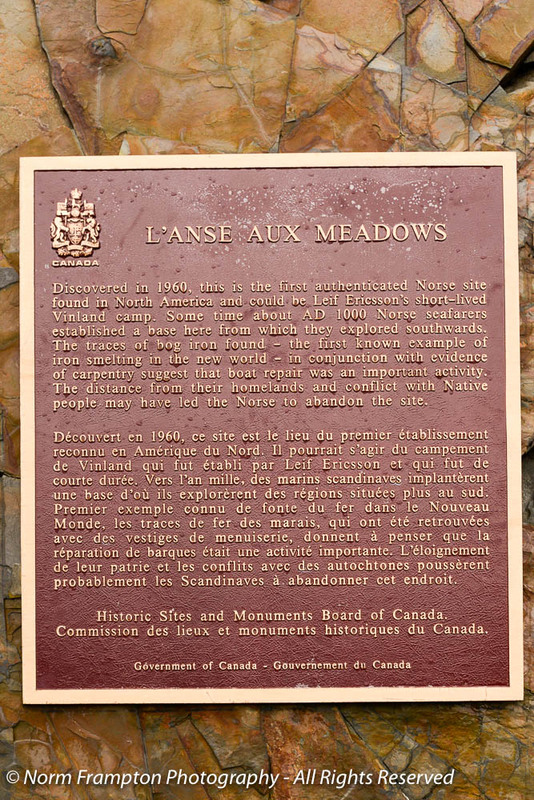 Open from late May until early October, despite its remote location L’Anse aux Meadows is well worth a visit for both the historical significance and the natural beauty. Next week I’ll take you across the road to the Norstead Viking Village, a privately run tourist attraction that reproduces a typical permanent Norse trading settlement similar to ones found in Greenland. Until then here’s one of my favourite Newfoundland and Labrador tourism bureau video’s, and yes the kids they found for this are absolutely adorable! 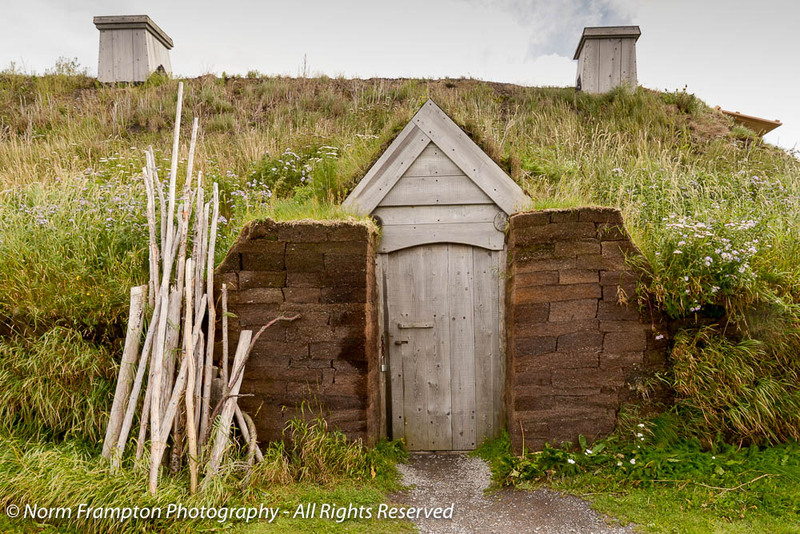 Gallery | This entry was posted in Photography, Thursday Doors and tagged Canada, Doors, L'Anse-aux-Meadows, National Historic Site, National Parks, Newfoundland, Thursday Doors, Tourism, Travel, Vikings. Bookmark the permalink. A very beautiful place and very interesting information. Have an excellent week-end! Norm, this an outstanding “Doors” post; Opens a door to another world, entirely. I visited here many many years ago (at about 11-12 years of age) with my family. That meant 500 miles of dirt road from Gros Morne up the Northern Peninsula. The mounds were just mounds then. With a few interpretive plaques, as I recall. But now!!! Just look! I’m feeling the need for a return visit. Thanks. Thanks Janet. Thankfully the road from the park up to the peninsula is in much better shape these days, but it was still a 4 1/2 hour drive. Worth it mind you, so if you get the chance a return visit could be fun. cool. 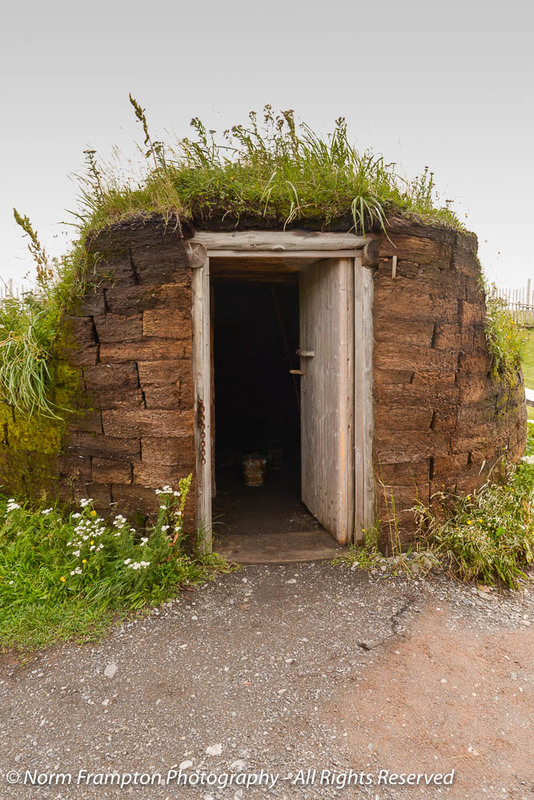 I like the door on the mounds. so wonderful to feel the hardships depicted in the pics – and loved the inside view. really does stir up gratitude…. Wow! What an amazing discovery. I had not heard about that before. I find stories and evidences from the Vikings to be fantastic.They were real adventurers. I’ll need to put this on my ever-growing list of cool places to visit. And the shots are wonderful Norm! Thanks Amy. It is a fascinating story indeed. If you ever make it out to that part of the country, it would be worth visiting. I don’t know if “isolation” would be as hard on them, as it would be in this time.Especially in the cities -we are overstimulated. I’ll add my WOW to the chorus of others. Those are amazing doors and they represent a part of history I don’t know much about. Thanks Trent. I know they’re doing a dig at a site in southern Newfoundland. Wow! What a fascinating place! We are going to Canada, leaving in a couple of days, but unfortunately Newfoundland is not on our schedule! However, recently we were in Minnesota and North Dakota where we saw some old Norse architecture and then I read an article about the Vikings in National Geographic, with a map showing all the Viking sites they’ve found. Who says Columbus discovered America?? Wow, what a fabulous place to visit. I love the earth berm homes, a perfect way to keep themselves warm on frigid days. Plus, they blend nicely into the landscape. Beautiful. 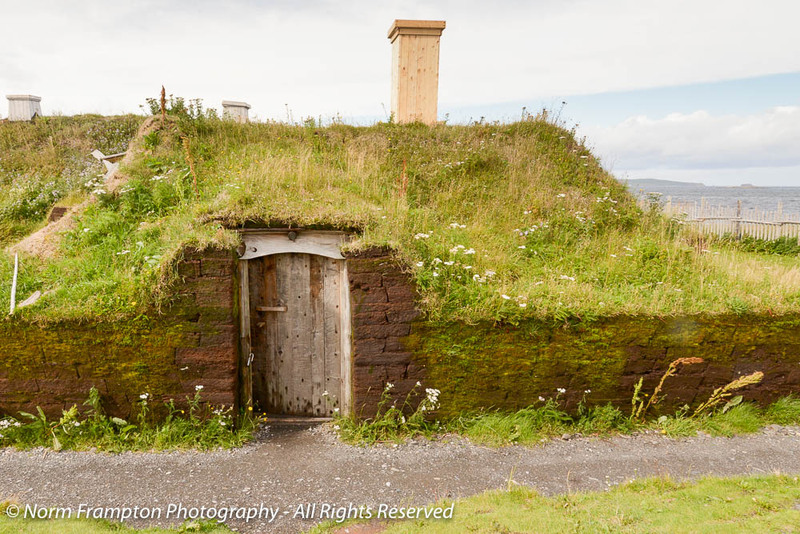 Wow – sounds like a great place to visit – especially those hobbit style huts! Thanks Jan. 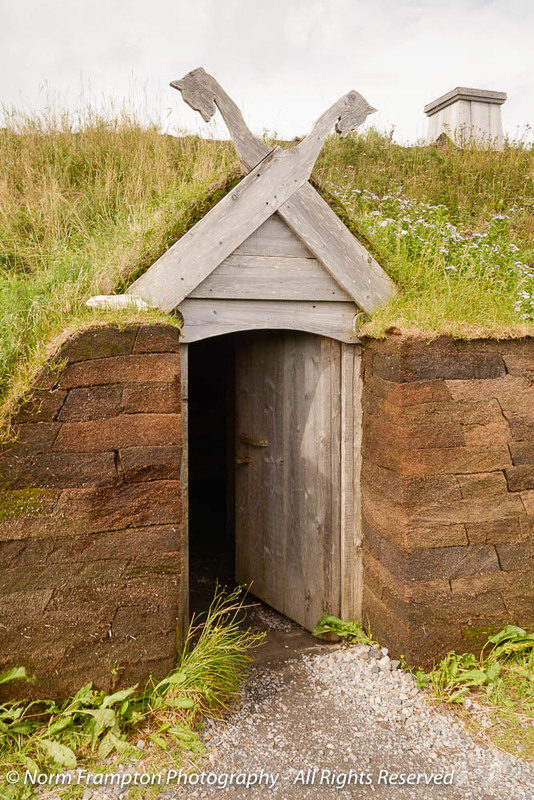 Apparently the short hobbit style doors were a deliberate design feature. The vikings wanted to make sure that any potential intruders forcing their way in would be coming in bent over with their heads down. The Eat.Pray.Love.Travels blog link on the Frog page seems to go directly into my blog editing page. Can you please take a look? Thanks, Norm. Was this a glitch on my end or were others also able to access my editing page from that link? Fan-freakin’-tastic! OH, how I’d love to spend a day there! Great doors, and thank you SO MUCH for the interior shot! Thanks so much Marian. That interior shot is one of my faves from the entire trip. At first I didn’t want the lady taking his picture with her phone to be in my shot. I waited a while but she settled in and started asking him questions, so I just went ahead and took the shot. Looking at it now I think it’s a better shot with her in it. What a magical place. Beautiful photography of some amazing doors. These are among my very favourite doors so far. Thank you! This is an amazing post. Thanks, Norm. I have yet to visit this beautiful & historical part of our country. Hoping to rectify that sooner than later! Newfoundland was the last province for me to complete my Canadian provincial bucket list. The entire time we were there the question that we kept asking ourselves was why we had waited so long. Simply fantastic, and a different way of life. Lovely post, Norm. You outdid yourself Norm. Best door ever! I love Vikings and the history. Love to go see that reenactment village. You took lovely photos of it. It was a special visit indeed. I’m on the other side of the country this week. Newfoundland is the only province I haven’t been to and it’s been on the list for a while. Perhaps next summer. I’m sure you’ll love it there if you get the chance to go. It’s amazing where people could go in boats, isn’t it? I would so love to see all of this in person, but you’ve given me a chance to see it without even going there and for that I thank you! I’ve always been interested in the Vikings and ancient history, so this is really fun. Thanks Janet. It really is amazing how humans figured out how to explore the entire globe by boat so many centuries ago. Wonderful post, thank you for sharing your visit, there is so much to learn about in this world and when there are doors involved, well, it’s even better! Needless to say I took lots of pics at this place. Interesting Thursday Doors on Norm’s blog this week. I thoroughly enjoyed this, Norm! I would love to visit this place. As I try to imagine making that journey, so many years ago, I come up short. The hardship of being at sea for so long, and struggling to build a settlement in what had to be unforgiving surroundings. It boggles the mind (well, my mind, anyway). Thanks for sharing the beautiful photos and the history of this place and its people. Columbus, pfffft. Well said, Dan. I too have trouble imagining the hardship, but also the bravery, because they set out not knowing what they would find, or when. We find our version of long distance travel difficult enough and yet we arrive in a fraction of the time with no worries of potentially starving along the way. Thanks Joanne. It’s so true. When my daughter and I drive 9 hours to Pittsburgh, people act as if we’re heading through Donner Pass in a wagon. It’s not that hard today. I suspect that most people think of a 2-3 hour car drive as long. For those of us who have routinely driven 8+ hours to get home, our perspective on *far* is very different. My brother drove 16 hours from Iowa to Pittsburgh so many times, I think he’s lost count. Last year, he drove in by himself to join us for a football game. ok – now I would consider 16 hours behind the wheel of a car to be rather long. Yikes. Can you say ‘numb bum’? I’ve made that trip a few times. Once with him in a moving van, towing my mother’s car behind us. Numb bum and so hard to stay awake. “Columbus, pfffft.” Well said. One of those things that sticks in my craw (it’s a pretty crowed place) is people still talking about how Columbus was the first European (even though at least now they mostly give credit to the First Nations). I’d like to think we could figure it out, but I don’t know, Norm. Such a great place, Norm. They recreated it so well and I loved that video. Norm, this post is why you are our leader. 🙂 What a wonderful opportunity to step back in time and appreciate the strength and resilience of our ancestors and understand history is not always as it is written. I think they could have written the book on living off the grid. Wow! This is a terrific piece of history. And the doors photos are wonderful. Wow, what a place to visit. I’ve read about the excavations carried out in Newfoundland, but to see these reconstructions is amazing. Nice doors, too! Thanks Debi. I felt the same way. I’d been hearing about this place since grade school so finally seeing in person was a moving experience.